Pleasant, fairly self-explanatory item. Main point of interest is that the sender, presumably a Briton, has patronised the Ottoman post office instead of the British one — more touristic value in the former course, perhaps. I can only assume the franking is more or less what it ought to be. The postmark date is illegible to me but, I assume, for it to have arrived on the 14th June it must've been posted in late May. Misses Cowan seem to have operated a small boarding school or something of that nature, from a brief search. The final item is probably the Kirkee arrival mark: the internet has it only a couple hours' driving away from Bombay. Most of the amendments to the address are self-explanatory, but I've got nothing on the small manuscript numbers (something to do with the registration?) and the word written in red at the top. *Per Proud: vagueness as in original. This is definitely something, though beyond that I've got rather little idea. We have, on the obverse, a 1½ anna postmarked with what appears to be a registration-label handstamp. On the reverse, the following postmarks: a Basra sub-office (Dorset Bridge? a terminal 'e' is just about visible), 19 October; Lower Baghdad, 21 October; and what seems like another Dorset Bridge, almost entirely off the cover. On the reverse, additionally, is an entire message, dated 28 October at Magil, Basra. The recipient is a Major Arthur Treasure, offer in charge of the Navy and Army Canteen Board office in Baghdad. What seems to have happened here is that Major Treasure, having received the envelope at Baghdad, took it with him to Magil, where he composed the message on the reverse. There's nothing to suggest that this second message passed through the mails, so I would assume he simply handed the letter to someone (a mobile army colleague, perhaps) capable of passing it onto "George." The strangeness of the postmark on the obverse I cannot explain. My guess is that the regular Basra canceller must've been incapacitated, for whatever reason, and somebody decided to use the registration handstamp to replace it. This would explain the (otherwise unusual) Dorset Bridge postmarks: the cover was posted at Basra (the main office, I must assume?) and arrived (for whatever reason) at the Dorset Bridge office, whereupon someone noticed the irregular postmark and applied a "regular" one before it went out to Baghdad. The inland rate for a basic-weight letter had been 1 anna, but Proud cryptically notes that "on 1 August 1921 inland postal rates were revised" without elaborating further. I would assume the rate increased to 1½ annas at this point. The context here, of course, is the anti-British rebellion which had just been suppressed: the "Arab troubles" referred to in the message. Although the worst of it was over by mid-September, and it seems never to have troubled Baghdad too greatly, Proud offers some colourful descriptions of several alarums experienced by its inhabitants. The revolt doesn't seem to have come anywhere near to Basra, so Major Treasure must be referring to his experiences at Baghdad, or wherever else. Service stamps on cover aren't at all commonly encountered: I try to pick them up on the few occasions I can actually find them up for sale, even if they're not necessarily extremely interesting. This item here is rather straightforward: an internal letter from Mosul to Baghdad, posted on the 28 May and arriving on the 2 June. Note that the stamps used are the regular occupation issue, despite this having been posted within the currency of the special Mosul issue: this prompts the question, which I hadn't ever considered prior to writing this very sentence, of what persons entitled to send official mail did in Mosul in this period — the Mosul issue was of course never overprinted for service use, so was the service version of the occupation issue just used without interruption? Answers on a postcard. The franking here I must assume is correct: see my remarks on rates below the above cover. I'm also unsure about the formalities required to send official mail at this early period: the familiar "official must sign at the bottom-left" procedure was possibly only introduced in 1925. The "No. 2292" at top-left is probably something, but what I do not know. Pleasant item despite a few disfigurements. The obverse is rather busy: we have the requisite official's signature and title at the bottom-left corner, but also an additional inscription at the top-left on which I cannot advise. The "on state service" handstamp is curious: per Proud, a regulation of 15 December 1925 stated that all official mail should be superscribed accordingly, but apparently a month later the regulations changed to require a superscription of "official" instead. One imagines the mail room of the Iraq Railways, having commissioned an "on state service" handstamp as required, were in little mood to change it shortly afterwards. I can offer nothing for the manuscript at top-left. Some barbarian has gone all over the reverse in biro, as is regrettably evident: I can only assume these are intended to be prices for the stamps as on cover — I have an old money Gibbons which prices these as 4d and 3d respectively (to which then add the 4x on-cover multiplier from the current catalogue). This was definitely a "find", despite its condition: I believe this is, by some margin, the largest Mandate-period franking I've ever come across. 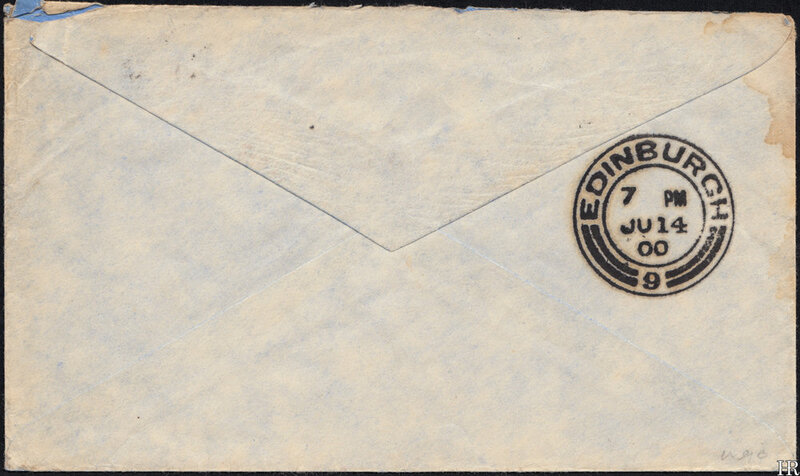 Registered envelope from a Mr Murad of Baghdad to Chicago, Illinois, posted on the 2nd March 1929 at the Exchange Square office and arriving in Chicago on the 21st March. Total postage is 4 rupees 10 annas, which is a considerable sum. The cost of a standard-weight registered airmail letter to the USA seems to have been 12 annas at this point (with the usual caveat that I find the treatment of rates in the Proud book somewhat confusing), so clearly we have a very considerable surplus of postage. Which leads naturally to the question of whether this is sincere or a contrivance. I count in its favour the ugliness of it: the sender doesn't seem to have had any aesthetic considerations in mind when placing the stamps (though there's more variety than was probably strictly necessary), and the recipient has opened the envelope roughly, destroying the ½ anna stamp on the reverse. Mr Nielsen, from a quick google, seems to have been an academic in the physics/engineering sort of area and has no obvious philatelic associations. Shortly after winning this cover I lost an auction for one with the same sender and recipient, from the same seller: that one was franked with 1 rupee and change and was entirely conventional-looking. All of which is dancing somewhat around the question of why the postage is so high: this is actually a relatively small cover, so I think there must be a practical limit on how much it could have weighed with its contents enclosed. I don't think this could've been insured: insurance would be the other obvious way for the franking to increase but, while I've never seen an insured cover from this period, ones from the 1930s have distinctive red markings which this lacks. Conversely, we see that the U.S. customs opened this up on arrival, which presumably they wouldn't have done unless they suspected it to have undeclared valuable contents. The general shape of the envelope plus its robust sealing also indicates that this might have carried something unusual. All very mysterious. The purple "registered" stamp on the obverse is presumably an American marking, likewise the strange purple smearing on the reverse. Registered airmail letter from a Mr Zilkha of Baghdad to Lloyd's Bank, London. Posted at Baghdad's Exchange Square post office on the 12th May 1932, arrived later that day at Baghdad's main office, and reached its destination on the 18th May. This must've been a relatively heavy letter: it weighing between 21 and 30 grams is the only way the franking of 98 fils appears to work. Second weight step for an overseas letter (21-40 grams) is 23 fils (15+8) and the third weight step for the airmail surcharge (21-30 grams) is 60 fils (20+20+20), so 83 fils in total plus the standard registration fee of 15 fils gives us the final total of 98. Of note here is the combination of the first and second 1932 issues: this was posted on Thursday 12th May — that is, the fourth day the second issue was available (it having been issued on Monday 9th). Evidently post offices were authorised to use up whatever stocks of overprinted stamps they still held before moving onto the second issue. We can see here that the Exchange Square office had already run out of overprinted 8 fils stamps (these paid the standard internal letter rate and so were presumably in high demand), but still had some of the overprinted 30 fils stamps left. Obviously this is a contrivance but it's an extremely attractive one. Registered surface mail letter from Baghdad to Chicago, USA. Rather large amount of markings here, as can be seen. The letter was posted in Baghdad on the 16th January 1945 and was then duly opened, read and re-sealed by a Baghdad censor (censorship of course being in place owing to the war). The letter seems to have hung around in Iraq until the 18th January, per the cut-off upside-down postmark on the reverse (the Arabic is legible but not to me, regrettably). Arrived in New York on the 9th February 1945 and was re-opened, re-read and re-re-sealed by an American censor. This apparently took a few days as the letter wasn't despatched from New York until the 14th, arriving in Chicago on the 15th where it was forwarded to the relevant post office, arriving on the 16th (postmark unfortunately illegible: "Chicago Stock Yards"(?)). I have no idea of the rates for this period: the franking here is 100 fils exactly, which might well be an actual fee, although obviously one which has been paid creatively.